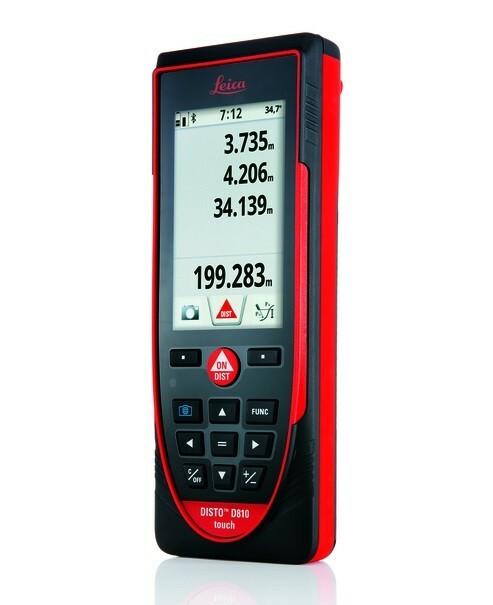 The Leica DISTO D810 touch is the first laser distance meter world-wide with a touch screen, allowing for quick and intuitive operation. Another revolutionary feature allows for measurements with pictures. Due to the integrated camera it is also possible to take pictures and download them with the USB-interface to a computer. The high functionality is perfectly completed by the smart free app “Leica DISTO sketch”. Simply touch-it! Large touch screen for quick and intuitive operation. Using common gestures such as swipe and zoom with two fingers, all the functions are simply and easily accessible. Measurements can also be taken using the touch screen. This avoids unintentionally moving the Leica DISTO™ D810 touch during the measurement. Measure with a picture It has never been easier to determine the width, height, area or even the diameter of an object. One measurement at right angles to the object is all it takes. Then the desired dimension is marked using two arrows in the picture and the measured value appears in the display. In addition to the zoom stages on the Pointfinder, an overview camera is available for large objects. Documentation using pictures The camera function on the Leica DISTO™ D810 touch can be used to create pictures or screen shots for recording purposes, which can then be downloaded to a computer via the USB interface. No details about the measured target points need be lost. Highest precision The Leica DISTO™ D810 touch offers a number of indirect measuring functions. Due to the specially developed tilt sensor the results are very precise. Even more accurate results can be achieved using the Leica FTA360 tripod adapter with its fine adjustment allowing exact targeting. Flexible data transfer In keypad mode, you can link your Leica DISTO™ D810 touch to your computer and send measured values in the form of a keyboard entry to any program. This provides a high degree of flexibility. Bluetooth® Smart and new free App – „Leica DISTO™ sketch“ The further developed App “Leica DISTO™ sketch” is the ideal link between the Leica DISTO™ with Bluetooth® Smart and a smartphone or a tablet. It allows you to create fast scaled drawings, dimension objects in pictures and checking construction drawings. It is even possible to integrate detailed sketches in an existing sketch, e.g. to a plan view. This allows you to have all the information together in a single document. The files can then be sent by e-mail directly to the office. ISO Standard 16331-1 – The standard for laser distance meters Range and accuracy of laser distance meters depend on light conditions and the reflectiveness of the measuring target. For Leica Geosystems it is important that the instruments not only perform under perfect laboratory conditions, but above all under the kind of everyday working conditions encountered on construction sites. This is why, working together with external experts, the company have developed a standard by which laser distance meters can be tested and compared with each other.